If I'm being honest skincare is not the biggest excitement factor for me. I think with most girls I find you're either a cosmetics or skincare kinda person, and I definitely sway more towards cosmetics. I'm not afraid to admit that, for my age, I also don't follow the typical daily skincare 'guidelines' like I should. I moisturize before bedtime, but in a morning, I never moisturize because I hate the way my foundation doesn't blend into my skin afterwards, but instead smudges and will not sit on my skin. Therefore I just bypass the whole thing. My skin type is combination, sometimes its oily, other times its dry. I also have problematic skin if I don't keep on top of my routine, so it doesn't take long before I notice a few blemishes should I get lazy a few nights with my nightly rituals. 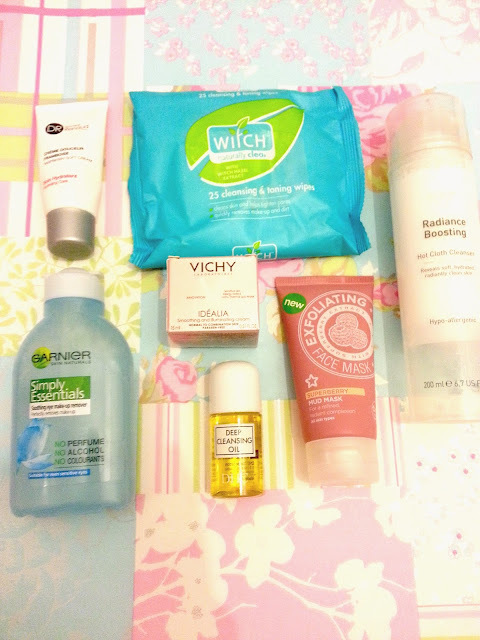 I did have a really good tea tree skincare range that worked wonders for my skin and I loved using it too, but for whatever reason, I haven't repurchased these items for a long time now. Instead I'm trying to get through my ever-growing skincare stash that keeps piling up from my beauty boxes. This means that I'm forever changing my products up (especially moisturizers) so my skin will probably hate me for that.. but without further ado, here are my skincare items that I'm currently using. Apologies for the really bad lighting in this photo! Dr Renaud Hydrating Care Raspberry Soft Cream - This was out a beauty box a good few months ago but I've only just got round to using it. It smells gorgeous and I love the consistency of this. It has an almost whipped feeling to it, but feels really light on the skin. I use this just before bed and it seems to do the job. Witch Cleansing & Toning Wipes - I have to have a pack of facial wipes in my skincare collection. I use these both morning and night. I like to use them to take the majority of my make-up off with before I go in for the cleanser. I usually go for the T-Zone facial wipes however these are only sold in certain shops so I had to grab what I could. I always do try to go for wipes that help with blemishes. 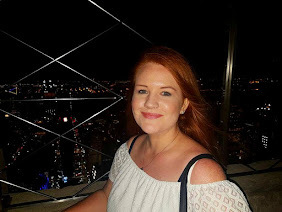 Although my all time favourite wipes have got to be Johnsons Dreamy Skin night facial wipes, I love how they take my make-up off and they smell divine too! No7 Radiance Boosting Hot Cloth Cleanser - I've had this a while now and have only just started using it. I think its meant to be a spin off from Liz Earle's Hot Cloth Cleanser (hence the name! ), but I've never tried hers so I can't compare. This feels really luxurious, its thick and really creamy with an almost whipped consistency. It feels like you're putting thick cream all over your face (but to then wash off!). This is part of my skincare that I'm forever switching up so although I like it, I probably wont be buying it again because I have other favourites. Superberry Mud Mask (By Superdrug, I think!). I was on the look out for a thick exfoliating mud mask in a tube for a long time, but I didn't want to pay extortionate fees. I came across this one in Superdrug for a couple of quid so picked it up. It smells like berries and has lots of exfoliating particles in (which is something I always look for in a scrub!). I've only managed to use it a few times so far but I'm liking the results. My face feels as soft as a babies bum afterwards so something must be working! DHC Deep Cleansing Oil. I received this from a beauty box a long time ago (I actually have 2 of these now). At first I was a bit apprehensive of using an oil substance on my face in replace of a cleanser, but I think this is a clever little product. You apply it on dry hands then to a dry face, and work it in.. and it miraculously removes all dirt and grime! I only use this if I feel my face has been a little dry of late, as I'm worried too much oil will make my skin... oily? Haha..
Garnier Soothing Eye Make-up Remover - A lot of my face wipes advise not to use on the eyes, so I have to have a separate remover for this. This time I have Garnier, but again, this is another one I switch up depending on which is on offer at the time. I tend to find oil-based eye removers are more effective, so I do opt for those if possible. So those are my current skincare products. They could look completely different next month... I'd really love to settle down with my skincare items and find ones that are suitable for me that I know I could have a lifetime friendship with but... there's just too many to sample out there and I'm always scared that I'm missing out on the next best thing!